To successfully generate buzz for the 40th Annual Daytime Emmy Awards, Gabriel Gornell went against TV tradition by focusing much of the show on talent outside of the traditional “soap opera” pool and embracing TV trends in areas of Talk Programming. One booking decision that he made was to include BOTH Bethenny Frankel and Kris Jenner as presenters on the heels of their daytime showdown—and fuel the rivalry. 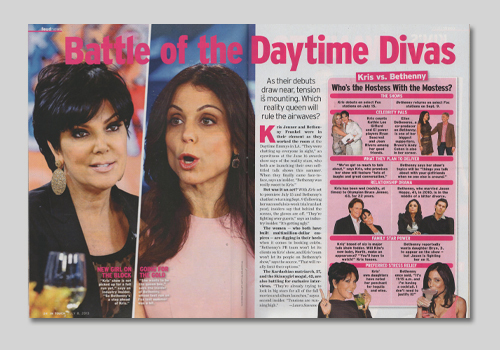 The stunt worked, and generated the desired coverage as represented in here in this full spread within InTouch Magazine.